A simple control panel for your rights. Check in realtime the status of your registrations, your repertoire and collected payments due to you. See the statements exactly as we receive them. No filter. Neighbouring Rights Collection is a service that enables Artists (main and/or featured singers, musicians) to collect royalties due to them. These royalties are due to the artist and the people involved in the creation of the recording of a track, when this track is played in radios/tv in a country which is a signatory of the Rome Convention. Every single country has a particular legislation regarding this kind of rights, and for most of the collecting societies reciprocity is limited to few territories, or to a limited set of rights. That's why the best option available is to proceed with a direct limited agreement with each single local society: you get the most out of each country, and you are not tied to the reciprocal deals of a single society. To handle this burdensome task, Off Limits has designed and made available a system, which enables you to check in real-time the status of your registrations, your repertoire and the collected payments due to you. You can preview in realtime what's your financial situation. Each statement received is made available online, so that you can clearly see in a single place online your aggregated income and the documentation received. You can test it out yourself with the demo of this site. The artist provides Off Limits with the mandate to collect on his/her behalf. 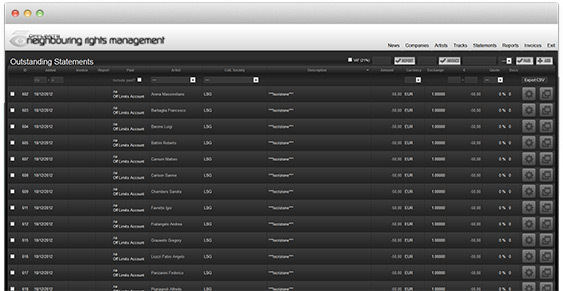 We import the Artist' discography in our system (and complete metadata, when missing). We take care of the registration in every single collection society we deal with and send them Artist's discography. Off Limits' staff then keeps constantly updating the repertoire and makes claims providing evidences of collaboration in a recording, where required and requested by collection societies. 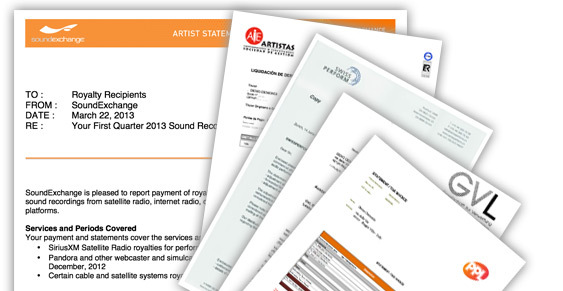 Twice a year, we generate reports, we calculate the due amounts and pay out the Artist. Off Limits in the business of neighbouring rights collection since 1995, and has now an extended network of direct reationships with all the major collection societies worldwide. We can collect directly in all the biggest music markets, and have a proactive relationship with the local collection societies.